Here's another J.F. 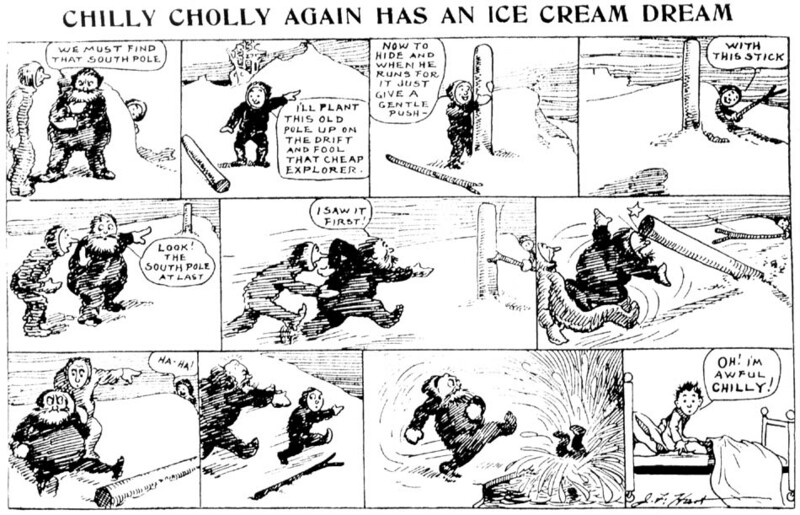 Hart production from the Philadelphia Record, titled Chilly Cholly's Ice Cream Dream. This one is a pretty blatant rip-off of the Little Nemo plot, even down to the archetypical final panel. The art on this one may look rushed, but the real problem was that this strip was printed very tiny in the Record. The size you're seeing it on the screen (before clicking on the image to enlarge it) is already larger than it ran in the paper. 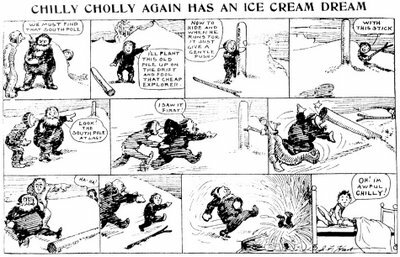 Cholly's chills apparently weren't good for his health, because he went to sleep permanently after just six episodes (10/29 - 12/3/1911). I have a drawing of my grandfather as a child eating cantelope that is signed j.f.hart. 01'. Would like to know more about this artist. I believe he was related. Time to take a breather from the mystery strips; the letter M promises to be a long list. So today instead we have Andy and Agnes, a strip by John F. Hart which ran in the Philadelphia Record from December 17 1911 to February 4 1912. Though formatted like a daily, the strip ran weekly on the the Record's Sunday humor and cartoon page. The Record resolutely resisted the higher circulation figures promised by adding daily strips and a color Sunday comic section for years after all the other Philly papers hopped on the bandwagon. Instead they stuck with their black-and-white half-page Sunday strip Willie Green plus an assortment of cartoons, humor, and comic strips on the other half page. J.F. Hart was an excellent cartoonist who seems to have spent almost his entire career at the Philadelphia papers (the Record mostly, but he did work for others as well). His specialty was cartoon puzzles, and he produced a series of them that ran for years in Philadelphia and were syndicated around the country. The puzzles took the form of a series of cartoons, and the reader was to deduce a common phrase, a geographical landmark, a famous person, or what have you, from the clues in each drawing. For instance, a washerwoman working her way through a huge pile of dirty clothes might have the answer Washington. The puzzles were often quite tough, but apparently the audience was up for the challenge. Here are the L for Lost features. Help them find their way off that crazy island! the title was changed to "Candorville". Has anyone ever seen a Continental Features/Continental News Service strip syndicated to a daily paper? "Continental Features/Continental News Service encourages writers, cartoonists and photographers to apply for sponsorship in syndication"
Sorta sounds to me like they might put aspiring writers and cartoonists into their magazine for a fee. Not to cast aspersions without proof, but this has the smell of a scheme to part amateurs with some of their cash in exchange for giving them 'exposure'. Maybe I'm just reading it with a a too jaundiced eye. Just a correction - "Lemont Brown" was renamed "Candorville", not "Rudy Park". Darrin Bell has two different comics named "Rudy Park" (from United Features) and "Candorville" (from Washington Post Writers' Group). Just a note. I have an original example of Fredrick's LATE,LATE WAR, it was actually syndicated by "ADCOX-LENAHAN, INC." in July 1960. If you'd like a picture of it, where would I send it? Thanks for the offer, but original art is no guarantee that the strip actually ran, so we need tearsheets to get a strip off the mystery list. In 1955 Art Gates had a comic book series for Charlton called Hillbilly comics, drawn in a Mort Drucker style. This may be an outcome of that. Life's Little Dramas...as told to Bart Hodges ran regularly in the 1947 Knickerbocker News (Albany, NY). But it was a short column featuring an incident in the life of some well-known personality. The only art was a caricature of the celebrity. Larry Brannon in the Kingsport Post, Tennessee; from 1963 to some time between 1966 and 1968. On Google Newspapers. Here's the list of undocumented strips for the letter K. Help! "Krass and Bernie" was a magazine cartoon, appearing in CARtoons from Feb. 1975 to Aug. 1991. It was revived in 2005 for Car Craft magazine. As far as I know, the strip was never syndicated. Thanks, Charles! Was the subject matter something that could have had a place in a newspaper? Maybe in the weekly automotive section? I haven't seen a copy of CARtoons in years and years, don't recall if they were 'family friendly' or not. In any case, that's an interesting nugget of knowledge. These oddball syndicates like Oceanic seemed to advertise things for years and years, yet I've never found ANY of their advertised strips in newspapers. Same goes for Dickson-Bennett Features, Southern Cartoon Syndicate, United Cartoonists, etc. Based on what I've seen of "Krass and Bernie", it was pretty tame, although I doubt the comic would appeal children. The comic was about a pair of car fans, and the comic's target audience were car fans, too. Krass & Bernie are alive and well and have appeared in every issue of Car Craft magazine since May 2005. Kith and Kin did exist in the Sunday Chicago Tribune newspaper, I think. I've seen quite a few Kith and Kin originals (really nice silhouette art) on eBay but have never been able to find the darn things in the Chicago Tribune archive. Maybe they ran in the NY Daily News? Hey! Found Kith and Kin in the online Chicago Tribune! After a loooong layoff I'm finally getting back to compiling the list of Editor & Publisher mystery strips. For those of you who are new here, a capsule explanation. E&P has printed an annual directory of syndicated features, including comic strips and cartoon panels, ever since 1924. Some of the features documented there are very obscure, possibly to the point that they never actually ran in any US newspaper. What I'm looking for from you, fellow researchers and comics fans, is documentary proof that any of these listed features did indeed run in US newspapers. If you have a newspaper tearsheet of any of these features or other equivalently concrete documentary proof, get it to me and you will in return get a goodie box of cool comic strip related goodies for your trouble. Joe Gish - Terry Gilkison - Publishers Autocaster Service - weekly panel - 1930-34 Found! by D.D. Degg in the Cass City (MI) Chronicle - thanks DD! "Mark: "Jack and Tyler" was my first syndicated strip, distributed by King Features Syndicate (1995-96). It got my foot in the door and left me there!" Hi Charles - thanks for the link; Mark Tonra is one of my favorite of the current crop of syndicated cartoonists. In fact I'll go so far as to say that I think "Top Of The World" ranks up there with any of the great classics. It is truly a masterpiece ... so naturally it died an early death. If anyone reading this hasn't checked out "Top Of The World", go RIGHT NOW and seek it out. I know it's archived on one of the syndicate websites listed here on the left side of the page. I promise you, it's jaw-droppingly, sweat-inducingly, palm-itchingly fantabulous work. And I am not one prone to gushing. Regarding his comments on "Jack And Tyler", on the surface it sounds like a slam dunk, but there is a possibility that the strip only sold to a few foreign markets, or the few US papers that bought did it only to make it unavailable in their market (yes, a truly nutty concept, but papers in the few big cities left with multiple newspapers actually do it). That's why I'm really inflexible on the tearsheet rule. If I don' see it on newsprint it doesn't qualify for Stripper's Guide. Ah. Very careful about which strip counts, huh? Well, since not many newspapers picked the strip up, you'll have to ask Tonra. It could've ran in his hometown newspaper. Thanks for the link to Tonra's website. I've sent an email asking for info. I'll keep you posted! Just to bring y'all up to date, as of two weeks later Tonra has not responded to my email asking about "Jack and Tyler". I just got an email from Tonra today (I asked if he would put some strips up on his site). He was apparently busy in September. Did you get his email yet, Allan? Sounds like our only lead is Kansas City. Unfortunately Missouri is one of the states that doesn't have any friendly microfilm lending libraries. Anyone in Missouri that can check the film? Well, we got a lead, at least. LA Times didn't actually run "Jack and Tyler" in their comics page, since I couldn't find the strip in a website that lists every comic-strip LA Times ran at one point or another (it's a very detailed site, complete with the dates when these strips ran in the paper). I am doing research for a history class at the University of Nebraska and the Plattsmouth Journal ran a comic called "Jackie" in the early 1950's. Its ridiculously racist, and follows a black soldier through the Korean War as well as when he returns home. Thanks for the info! If you could send me some photocopies from the Salem paper we can 'de-mysterify' your strip and I'll send you a goodie box of neat stuff. Here's another one to add to the mystery "J" list. In the book "Indiana's Laughmakers", editorial cartoonist William B. Robinson is credited with creating the panel cartoon, Josephine. Might you be referring to Robbie Robinson? He did the panel Josephine from 1949-62. Here's another of the strips that ran in the New York (Morning) World (on which I refer you to my comments in yesterday's post). This one may really be the last continuing comic strip to appear there, at least in the mid-teens. Gene Carr's The Sayings and Doings of Mr. Always Wright ran February 12 through March 13 1914. I've indexed the World through August of that year, and there are no more strips to be found in that timeframe.